A quick and easy way to gain additional shaded area on your pontoon boat while protecting your seats from the harmful UV rays of the sun and other harsh weather conditions. Shade is available in sizes to accommodate up to 102" width and extends out to 12 ft. of coverage. Constructed from Hot Shot marine grade polyester fabric, the top is strong yet lightweight. 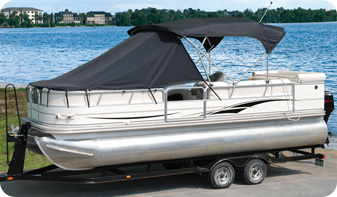 It is secured to the front bow of your existing bimini or hard top and down the playpen railing with adjustable straps for quick release buckles for simple and fast installation. Shade folds down to compact size for ease of storage and is available in 9 colors to best match your boat. Not for use while underway.